Everything (and everyone) must come to an end, and the sad news came today that Raymond Berthillon, the founder of the famous Ile Saint Louis ice cream place passed away on Saturday, at the age of 90. If you've been to Paris, you've probably stood in line at least once in front of his landmark store - or in one of his approximately 150 Paris area resale shops. To maintain the quality of his ice cream and sherbets, Mr. Berthillon always refused to industrialize the production and would only offer seasonal flavors (depending on which fruit he would find at the market!). And of course, like any self-respecting Frenchman, he would close every August so that his employees would enjoy a month's vacation! So the next time you enjoy a Berthillon ice cream, remember to think of the man who started it all. More on Wikipedia. A sad day indeed. A visit to Berthillon on Ile Saint Louis is one of our best memories of our first visit to Paris. We watched a young boy anxiously wait his turn, as we waited for ours, and my husband remarked that it reminded him of the covers that Norman Rockwell painted for the Saturday Evening Post. It was the best ice cream I had ever tasted. RIP M. Berthillon. A nice tribute to M. Berthillon Eric. Sure, you could not miss this. And I will never eat a Berthillon ice cream the same way now. Really sad news! Merci Monsieur Berthillon for the wonderful icy treats! Well the good news is that he lived 90 years and that Berthillon will remain in the hands of his family. This, I think, is the first I've heard of him, but that's the right way to make ice cream. A life well lived! Sad news indeed. I have benefitted from his ice cream brilliance many times. Lovely tribute pic Eric. Merci Louise. I will have one as a tribute this weekend! To be honest, I did get an ice cream at the shop, but at the time, I was oblivious of its significance. I only remember I had an unusually flavored ice cream and that I savored every bite. 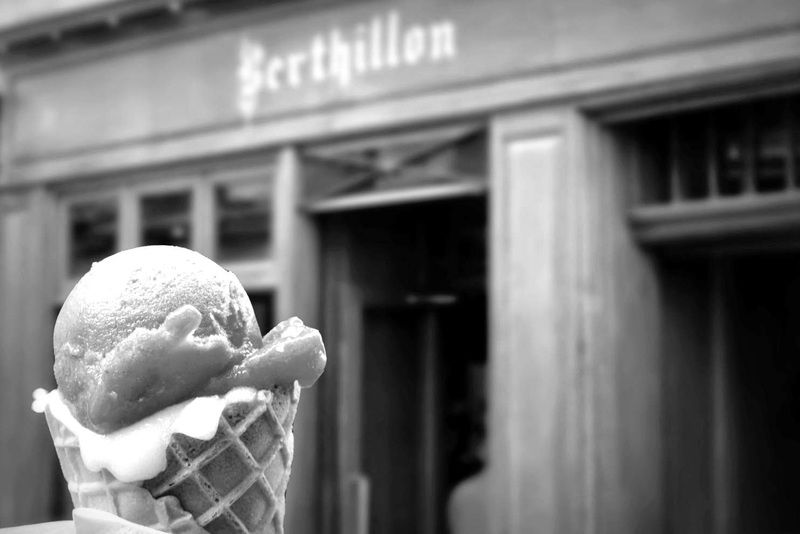 The "religious" aspect of having a Berthillon ice cream does exist though, but probably mostly among Parisians! R.I.P. Monsieur Berthillion - your ice cream will go on, carrying your good name ! "your ice cream will go on, carrying your good name !" exactly! Isn't that wonderful? I know, like your husband said: "What a confident businessman to close an ice cream shop in August!". Crazy isn't it?! This probably explains why someFrench are not so good at doing business! SO sorry to hear this. I once stood on line for his ice cream in February—while it hailed! Oh that is sad news. Whenever I visit Paris, I make a point of having ice cream here, sometimes twice.